Love, happiness, Peace and Success. Beside kolak pisang nangka, I also made this soft bread for tadarusan at the masjid. I made some adjustments to the recipe though. First, since that my singkong (cassava) was already tasty and sweet, I cut down the sugar amount, about 40 percent, from 125gr to only 75 gr. And it was still OK for us. For a balancer, I almost doubled the cheese. So, the taste was more cheesy than sweet. Second, I was not careful reading the recipe, I accidentally poured all the coconut milk I had, 250 ml to the batter (it only needed 200 ml). I assumed that too much liquid (coconut milk plus melted butter) would make the batter thin. As the result the cake would be dense. And I didn't want it to happen. Then, I decided to omit the melted butter (50 ml) and hope that it was still nice without melted butter. And it was. Perhaps it's because coconut milk was also tasty and contain oil. Third, when I was beating the egg with the sugar, I felt that the batter kinda difficult to thick. I thought that maybe it was because the recipe only used 1 egg, maybe it needed more egg, so then I added 1 more egg and a little sweet condensed milk. I read somewhere, I forget, that condensed milk can be used as a substitution for emulsifier. And it worked, the batter thickened faster. Because this was my first attempt in making red kidney bean doughnut, I only made a small batches. The dough was soft but not that sticky, so it was easy to be handled. 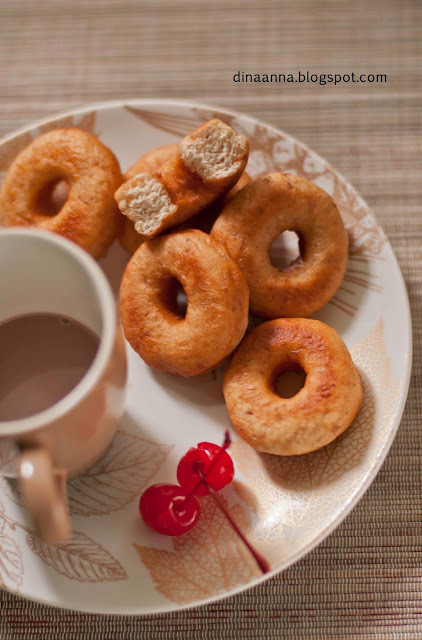 When it came fresh from the frying pan that morning, the doughnut was so soft. The taste of kidney bean was subtle. Event my children could not trace it, only that Rachel asked me what 'secret ingredients' in there that make spots in the doughnut... ah, she knows me so well, I always try to sneak 'something' in their foods...lol. 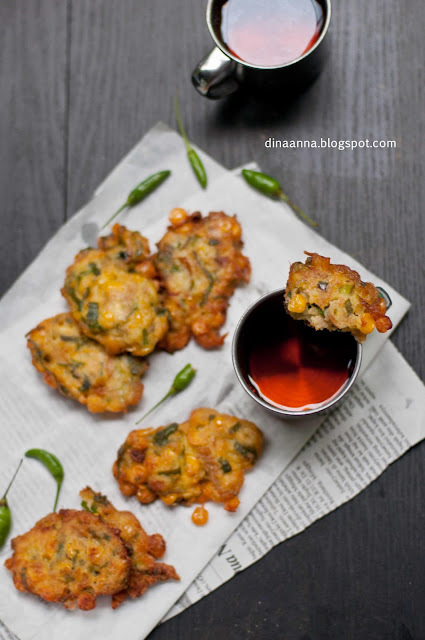 Basically it is oyster mushroom that is coated in flour mixture and then deep fried. To make it crispier, as I read in many sites, we can do one of the following. First is dipping mushroom in beaten egg first before the flour mixture. Another is dipping it in wet batter of flour and then in dry flour mixture. This morning I tried the second way. I got the recipe from sajian sedap. I made half of the recipe and since there were some leftover batters I added some chicken wings in it. I thought that my curry powder was mild curry. The taste was subtle but surely make the mushroom and chicken more tasty and have nicely golden color. They were crunchy with crispy skin, especially when they were fresh from the pan... In the afternoon they were a bit soften though I kept them in tupperware. 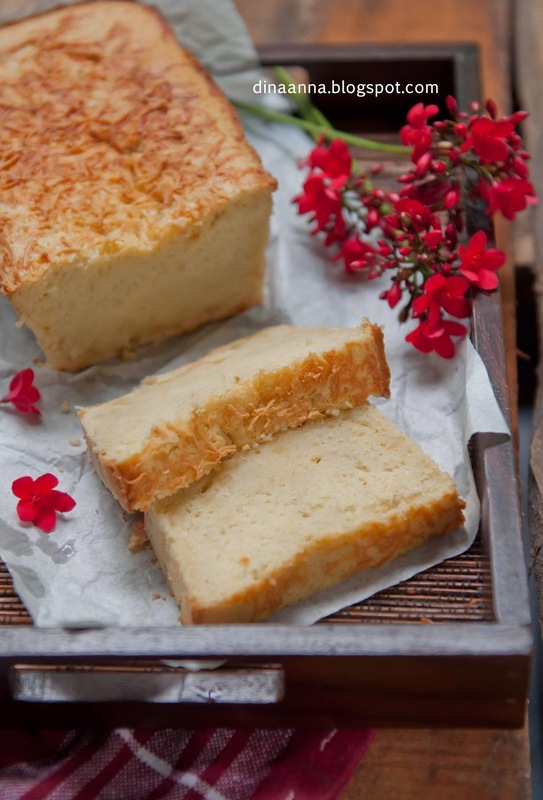 I first saw the recipe for this bingka ubi (baked cassava cake) in just try and taste blog when I was googling for cassava recipe. I directly bookmarked it and finally could try it last week when I luckily got yellow cassava from my veggie seller (it is very rare here). Using yellow cassava will make this bingka beautifully yellow without food coloring. 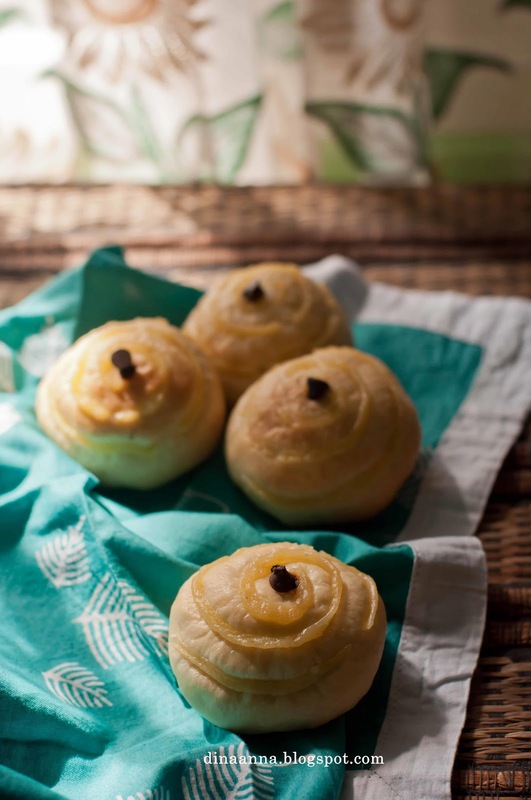 This bingka is easy to make. The only thing to be worried is grating the cassava. It was really a good arm exercise. Though mba Endang from Just try and taste processed it in a blender but I prefered the traditional way, grated it using a coconut grater. This bingka turned out so nice, sweet and soft. I never regret to bake one recipe (not a half as usual) because this keep in fridge well for days. I used a round 22 cm silicone baking tin, so it is shorter than the original wendy inkk's one that used a 20 cm one. I didn't make any change to the recipe, only added pandan leaves when boiling sugar to get nicer aroma. 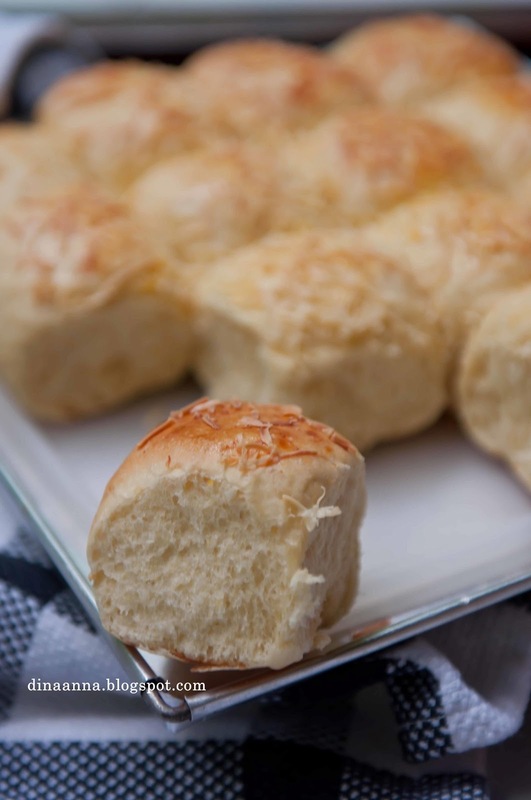 After baking for 1 hour my bingka was still golden pale. I baked again for 15 minutes but it was still not brown. Then I decided to take it out and stop baking to prevent it from drying. Next time maybe I will bake it at higher temperature to get the brown crust. 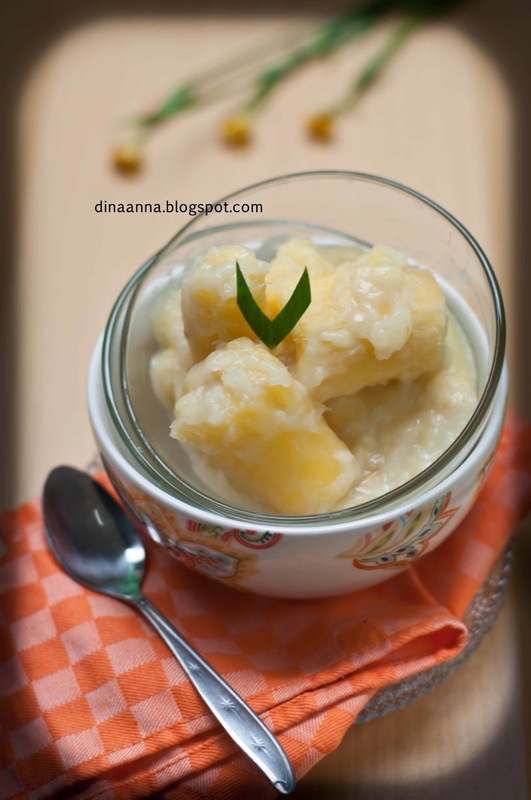 When I was a kid, my mom liked to boil cassava (singkong) in a thin coconut milk with salt and bay leaf. It made a savory cassava. I like it very much and always think that the coconut milk will best pair with salt to be a savory dishes. I never knew that cassava can be boiled in coconut milk but taste sweet as what ncc-indonesia made and called it singkong Thailand. Curiously, some days ago I made half of the recipe. But silly me, I forget to divide the maizena in half, that made my sauce became thicker than the original recipe. It tasted good though it was too sweet to me. 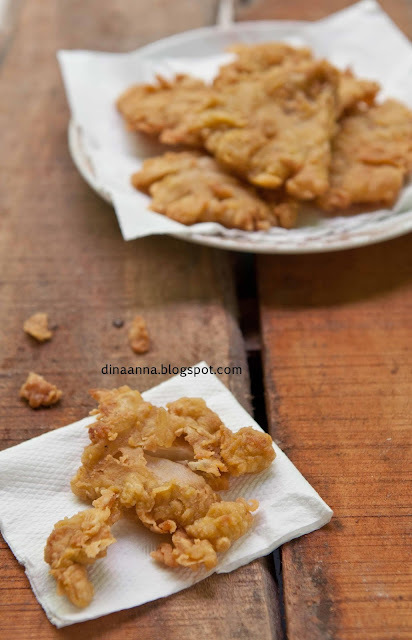 When I made this, my assistant who came from Boja district at Kendal, near my house, told me that people in her region will boil cassava with grated coconut and palm sugar instead. Curios again, I asked her to make it for me. She didn't use any measurement, just put the ingredients in a pan and adjust the taste by adding this or that. Honestly, It tasted strange to me. 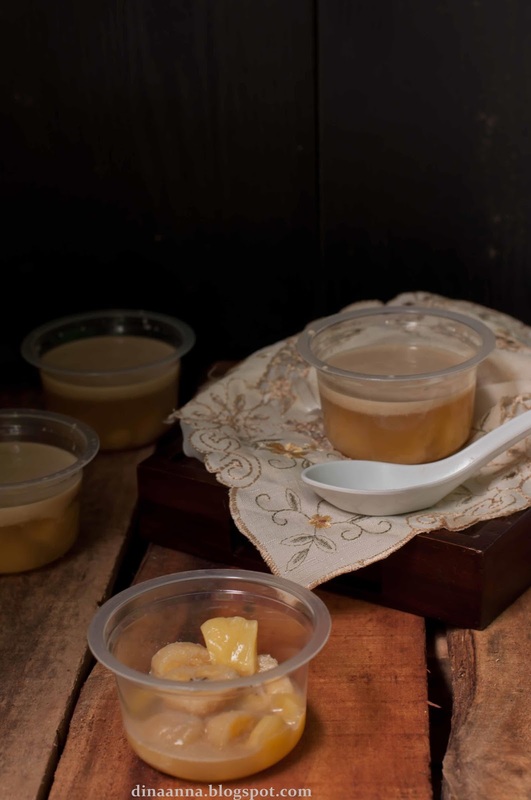 It was good, I liked the sweet and aroma of the palm sugar but still I will vote for the savory one. 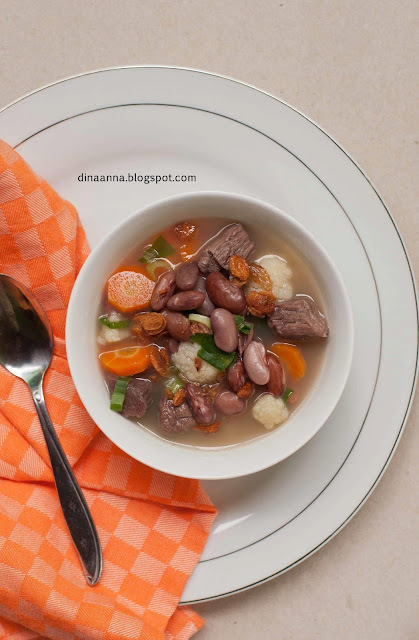 This red kidney bean soup is very simple. Unlike brenebon (Manadonese kidney bean soup) and angeun bereum (West Javanese kidney bean soup) that use many spices, this soup only needs the common soup spices: garlic, salt and pepper. But the taste is still very hearty. It's perfect for the lazy weekend like today. This was my second roti singkong. The first one was about a month ago. 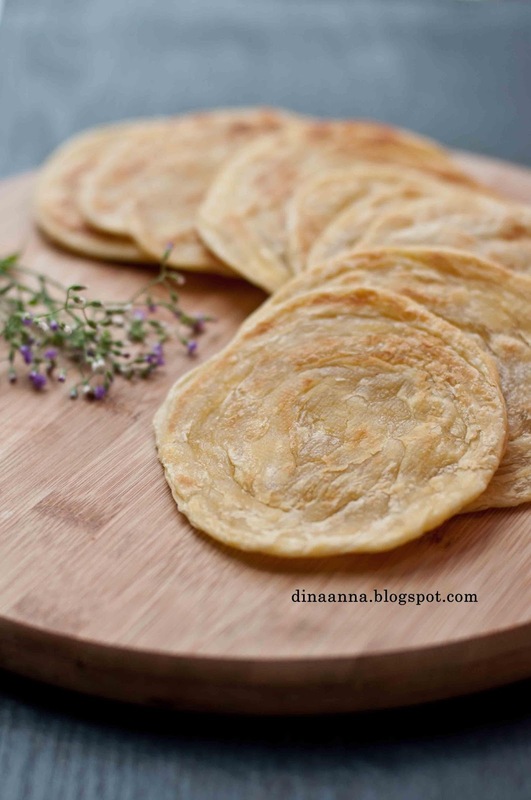 I used roti kentang recipe at that time but substitute the potato with cassava. It turned out not bad actually, rose well and soft, but it was a bit chewy and very satisfying. We could only eat one, no more... I thought that maybe it was because the cassava and potato have different texture. Maybe, in bread making especially, cassava and potato were not an equal substitution. So, this time I reduced the amount of cassava. I also added water while mashing the cassava until it was smooth like a paste. And it worked. This cassava bread was so so much better than before. It rose higher, softer and not chewy anymore. I added cocoa powder to some part of the dough and formed it into flower and pull-apart shape. I got the idea of the flower from mba Hesti's blog but mine was turned out not as pretty as hers. The dough was sticky make it a bit hard to be handled. I made this bread as the snack for my children when they did the rehearsal for the akhirussanah (graduation ceremony) at their school yesterday. Iban, my son, finished his TK (kindergarten) this year and will go to SD (elementary school) next July. Congratulation Iban. We are so proud of you. I like to dissolve instant yeast in some lukewarm water before I start making bread. With this way, I will know whether my yeast is still fresh or not. In about 10 - 15 minutes, the fresh yeast will frothy while the dead yeast will keep staying like it is, not changing at all. If I find my yeast frothy then it means good, I can continue making bread. If it is dead? throw it in the sink and start again with another yeast. Dead yeast doesn't work! 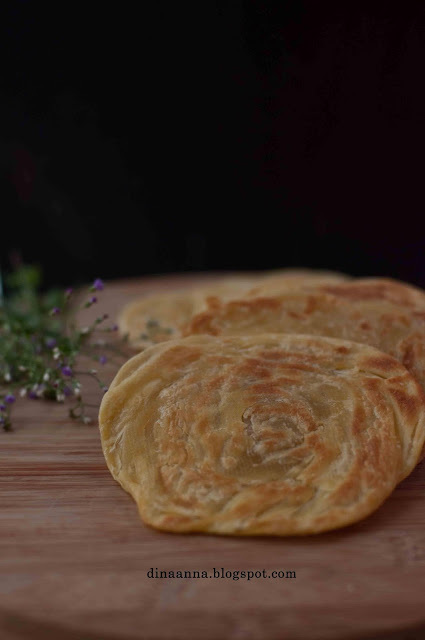 So, when I see a recipe that need 100 ml cold water like this potato bread recipe I used here, I will divided it into 2: 30 - 50 ml warm water and 70 - 50 ml cold water. Why? Because yeast likes warm and comfortable environment to live. How warm? As warm as we feel comfort. So, usually I pour warm water into a cup and I dip my finger in it. If my finger can stay there comfortably, so can the yeast. 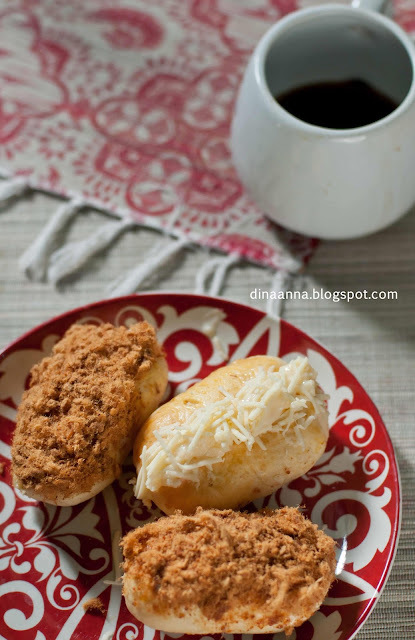 This was my first pao or bakpao in Indonesia. For so long I though that it was difficult to make a bakpao. 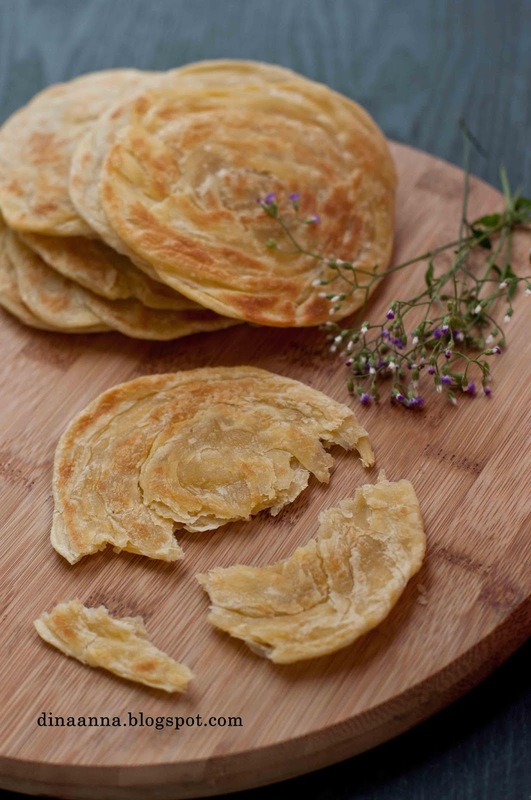 At least it required special flour (pao or tang mien flour) and white butter (shortening) that are not easy to find around. 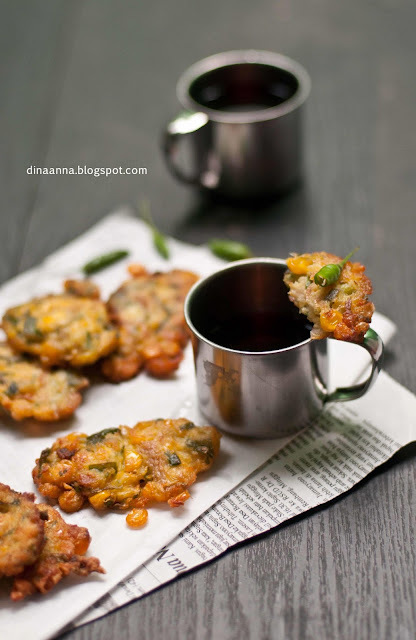 Then I saw this pao in mba Hesti's blog. She just used all purpose flour and oil. I was so happy and decided to give it a go. The ingredients and methods were similar to those at bread making, only that at the final step we steam the pao rather than bake it. I form some pao into buns and some others into the rose like what was described in wendy inkk's blog. 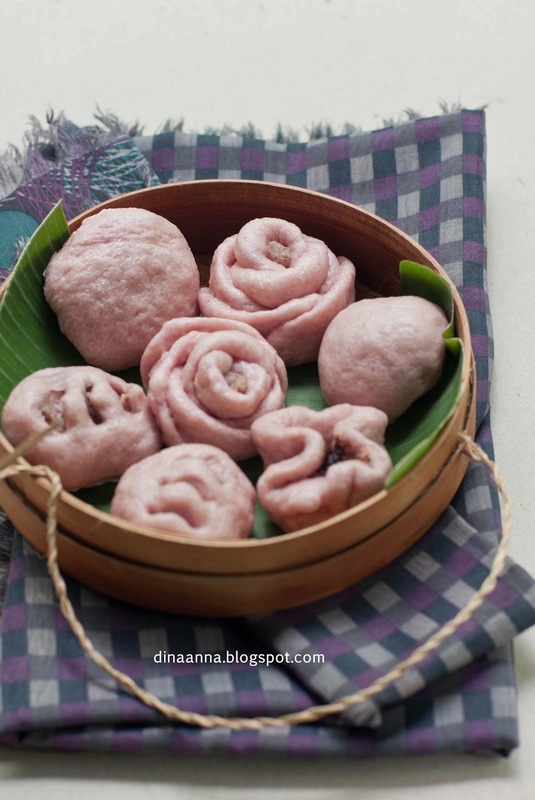 I fill the bun with chocolate rice and the rose with Indonesian style red kidney bean paste. 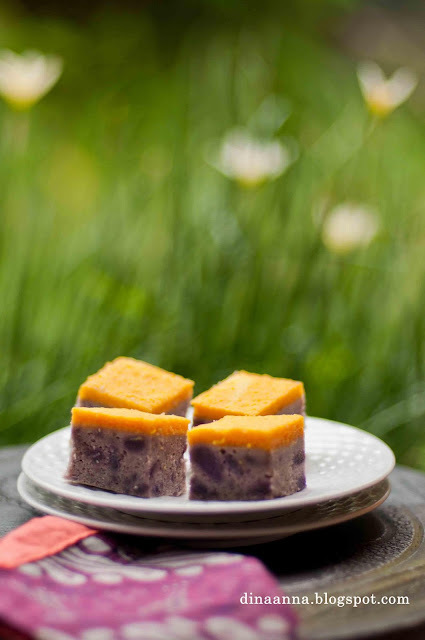 Unlike other red bean paste, Indonesian style used red kidney bean not red bean and coconut milk. Bakwan jagung or corn fritter is one of our favourites. I usually make it without measurement. Then, fry it until golden brown. Sometimes I like it thin and crispy but other time I prefer it soft and fluffy. This time I sneak oyster mushroom to the batter. My children still gobble them all up. 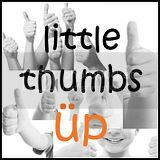 I am submitting this post to little thumbs up event this month, organised by Zoe of bake for happy kids, Mui mui of my little favourites DIY, and Joyce of kitchen flavour. 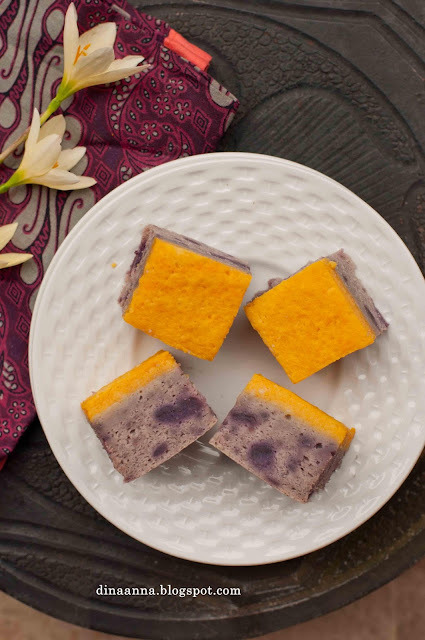 The idfb challenge 10 is about kue lapis traditional. 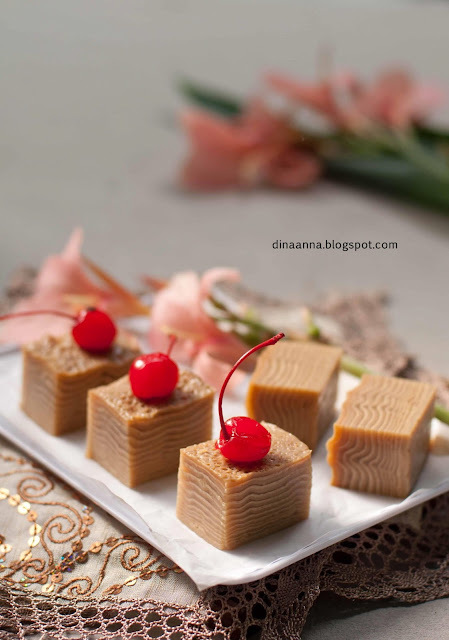 As you know, Indonesia is a home of kue lapis or layer cake, from baked kue lapis like lapis legit or lapis surabaya to the steamed one like lapis beras, kue pepe and a lot more. 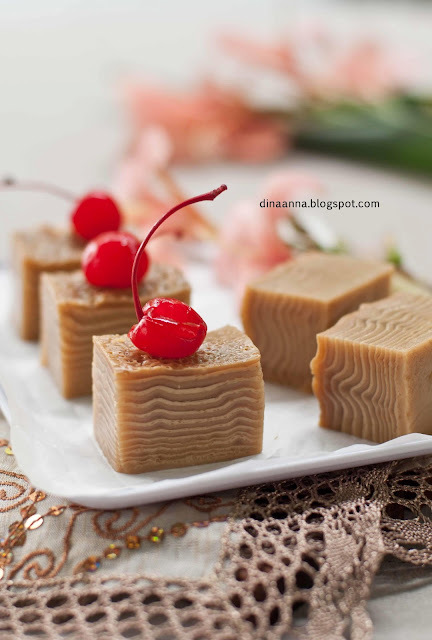 It is not easy to make a kue lapis. It needs patience and a lot of time. We have to bake or steam one layer at a time for about 5 - 10 minutes and then pour the next layer over the already baked or steamed one and so on until all the batter is all used up. 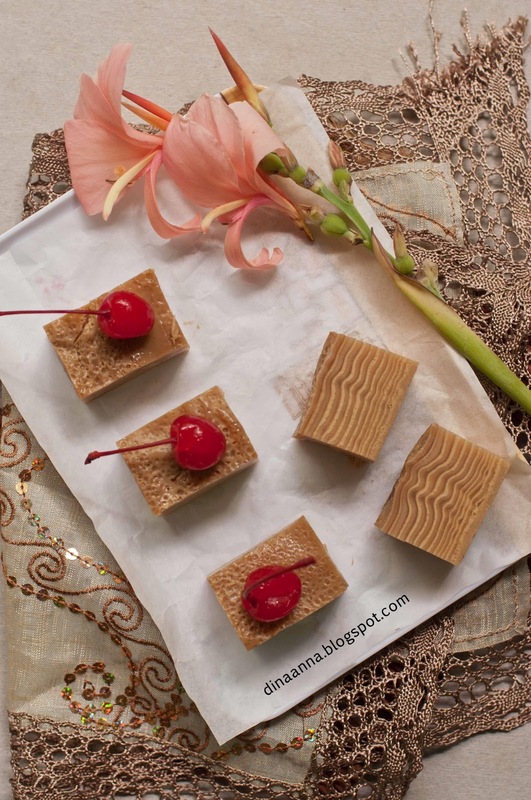 My only experience making kue lapis is about 2 years ago when I was still living in Perth. I wanted to eat kue lapis beras pandan so badly at that time that make me dare to make it myself. My steamer was so small and even I didn't have a baking pan. I used a small enamel bowl that only fit 1/4 part of the recipe. It was so challenging but the taste was sooo delicious though it was not pretty. It didn't have an even layer, some parts were bumpy. Maybe because the heat was too high or my stove produced uneven fire. Some layers were also thicker than the others. Maybe because I already pour the next part of the batter while the previous layer was not set yet. Or maybe because I didn't measure the batter before pouring. Therefore I am so happy to find this lapis india recipe at mba Hesti's blog. As I read at kompas online and surya online, this lapis india is a favourite and now become an icon from Banjarmasin. 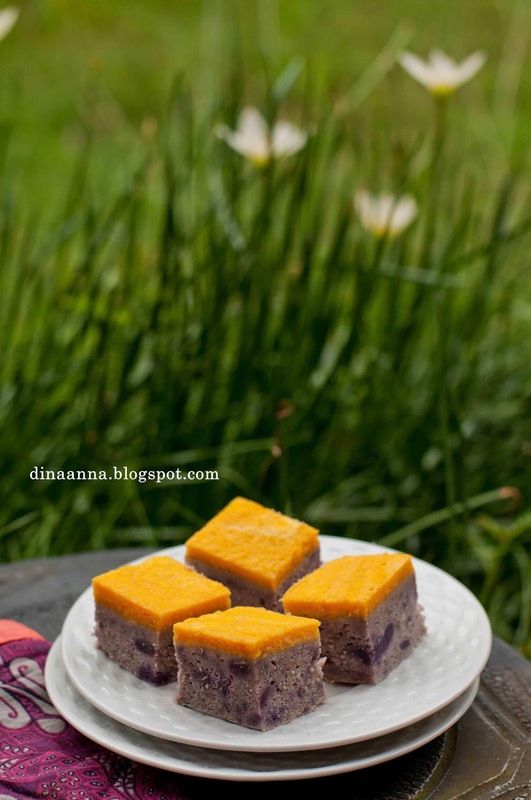 It seems simpler than the other kue lapis. We do not need to divide the batter into 2 or more parts. We only use 1 batter and surprisingly the layer forms its alternating color by itself. We also do not need to bother about uneven layer because it is the wavy that make this kue so pretty and special. Greased all sides of a 16 square baking tin. Line with baking paper and grease again the paper. Place on a steamer and heat on high. Finely sliced palm sugar. Combine with water and pandan. Boil until the sugar dissolve. Set aside to cool. Place coconut milk, hunkwe, sweet condensed milk and salt in a blander. Strain the sugar mixture to the blander. Pulse to dissolve the flour. Add in eggs. Pulse again until all well incorporated. Strain it to a bowl. Pour 3 laddle (100 ml) of the mixture to the baking tin. Cover the steamer lid with kitchen towel and steam for 5 minutes or until set. When the previous layer is already set, stir well the mixture and pour again 100 ml over it. Do it until all the batter is all used up. After the last layer, steam it for about 20 minutes. I am not really familiar with mushroom. The veggie seller who comes daily to sell veggies to my surroundings rarely bring mushroom except oyster and sometimes with request, button mushroom. Unfortunately, my son doesn't like those two. So I almost never cook mushroom. Until some days ago, I found that the mini market near my home now selling dried black wood ear, shitake and white coral mushroom. Directly those three moved into my basket. I already know what to make with them. 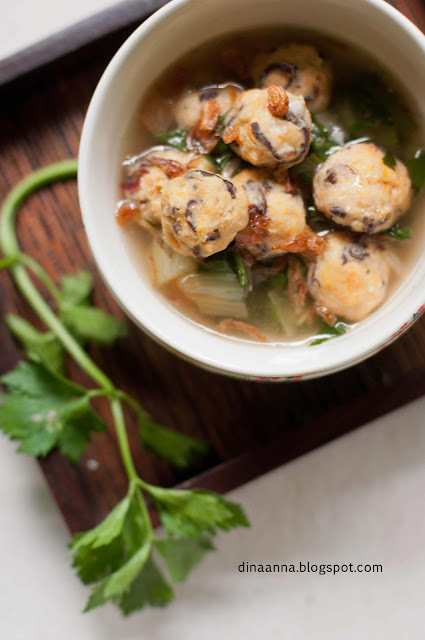 First is this bakso wortel jamur (carrot and wood ear mushroom ball in clear soup). Actually I wanted to make bakso rambutan that is meatball made of chicken, shrimp, carrot, mushroom and glass noodle. 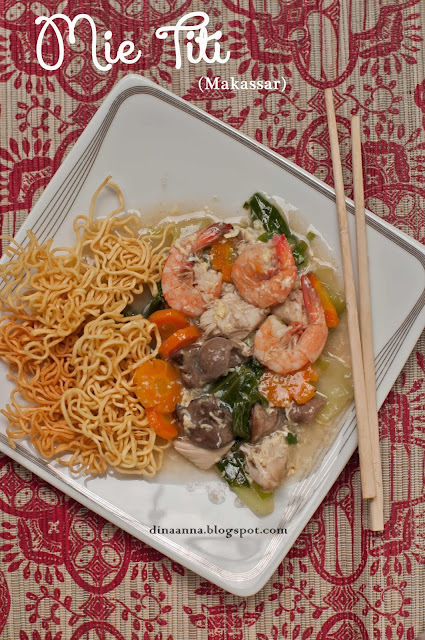 But I forgot to buy the glass noodle, so it's only bakso wortel (carrot) jamur (mushroom), then. It turns out so good. My children love it, on its own or as a soup with warm rice. No complaint about the mushroom, oh it's really nice. Whenever I go to a bakery I always so impressed with how they shape the bread with various toppings and fillings. 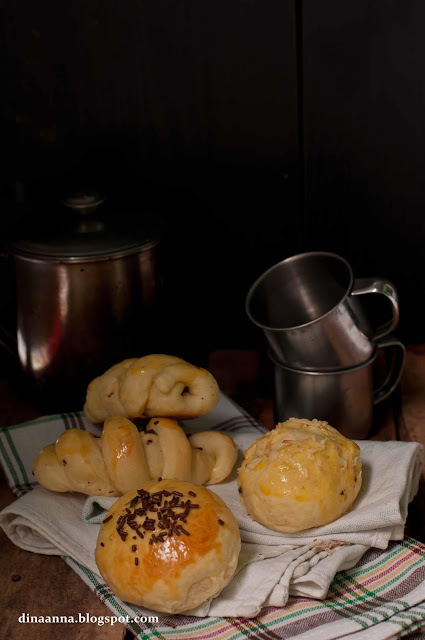 I laugh to myself who make bread mostly with the standard topping and fillings like cheese or chocolate. My children, in fact, never get bored with my bread but I think it is the time to try something else. So some days ago I made streusel for the filling and custard for the topping of my banana bread. It consumed more time of course, but seeing smile in my daughter's face delighted me. Dissolve yeast in 50 ml warm water. Set aside. Combine mashed bananas, flour, milk powder, sugar, and egg with a wooden spoon. When the yeast is already frothy, pour it into the mixture and knead until all are well blended. We can use the mixer with the dough hook or just our hands. Add oil or margarine/butter if you like and salt and knead again until the dough is elastic. Drop extra flour spoon by spoon if the dough seems too wet. Round the dough into a big ball and put in the greased big bowl. Cover with cling wrap or damp tea towel and let rise until double in size for about 60 minutes. Mix flour, margarine, milk powder and sugar with a fork. Stir in chocolate chips. Set aside. Combine milk, flour and sugar in a saucepan. Boil on low until it thicken and bubbling. Remove from the heat. Add the yolk, stir it quickly until well incorporated. Transfer to a piping bag and set aside. Punch the dough. Knead again briefly. 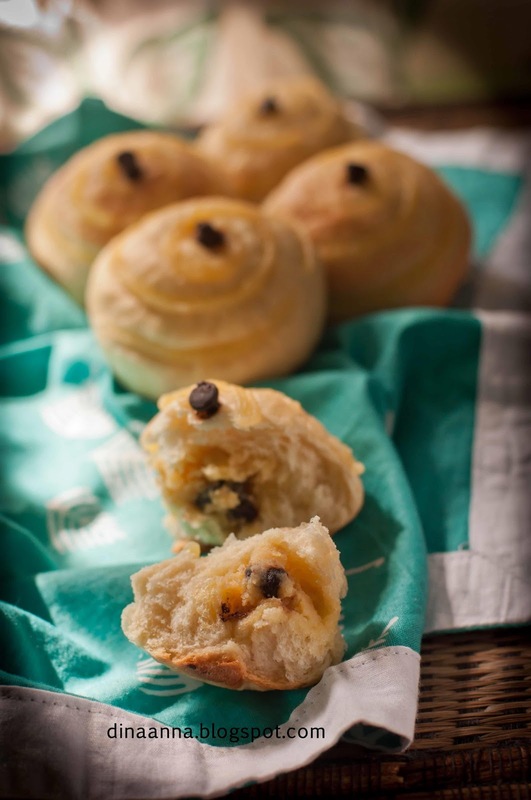 Cut the dough into 35 gr each, roll it into a ball and place it on a greased baking pan. Flatten the dough, fill with the filling and roll it again. Cover and let rise again for another 60 minutes or so. Heat the oven. Brush the bread with milk and pipe the custard on it. Bake until golden brown. 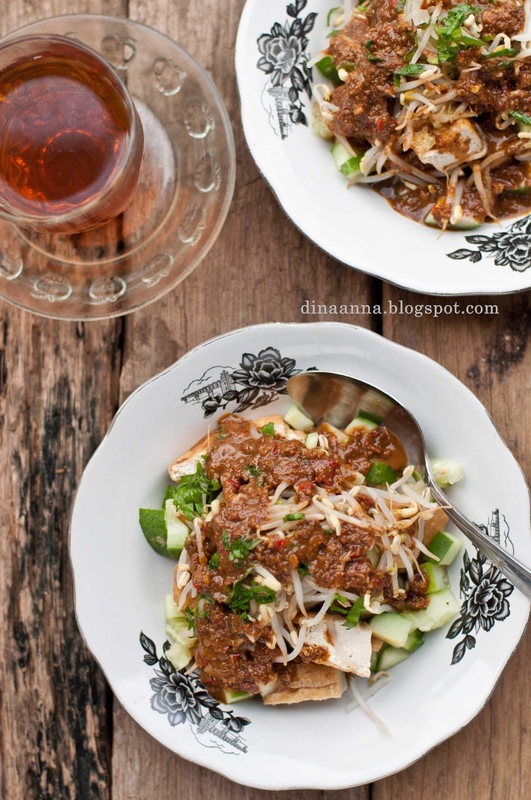 Just like tahu telur, this tahu gunting or also known as tahu tek is very popular in East Java. 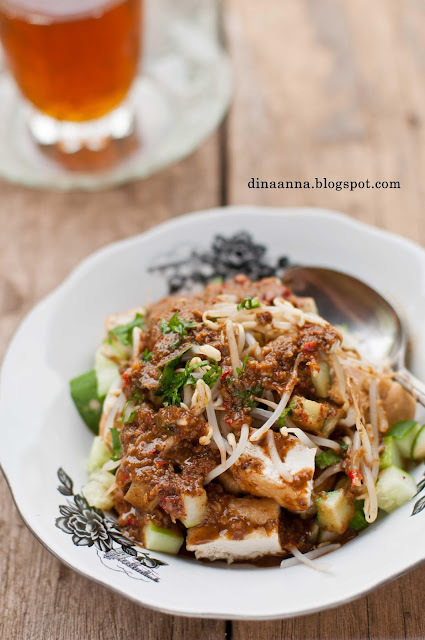 It is a dish that contain fried tofu (tahu), beansprout, cucumber and rice cake (lontong) with peanut-petis sauce. The tofu is cut using a scissor (gunting) rather than a knife. That's why it is called tahu gunting. Heat oil on a wok. Fry the tofu until golden brown (marinade with garlic, coriander and salt if you like). Drain and cut cube. Place bean sprout on a bowl. Pour in hot boiling water. Simmer for 5 minutes. Remove and drain. Peel the cucumber (I didn't do that to add green colour on the dish), discard the seed and chopped. Wash the celery and finely chopped. for sauce: Grind garlic, chilies, palm sugar and peanuts until fine. Add petis, water and sweet soy sauce. Mix well. Add the vinegar. Mix well. Taste with salt if necessary. 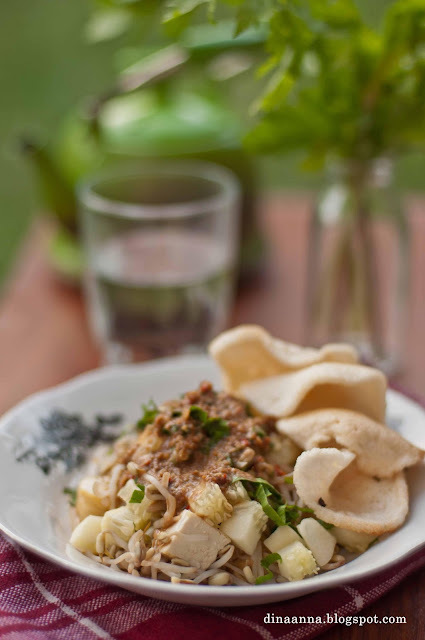 Serving: Slice ketupat/lontong, place on a plate. Top with the fried tofu, bean sprout, and cucumber. Pour the sauce. 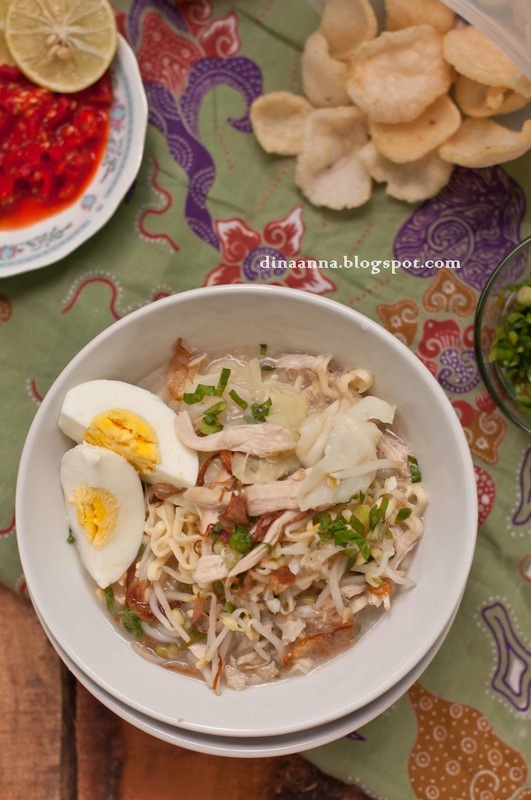 Garnish with celery and kerupuk. 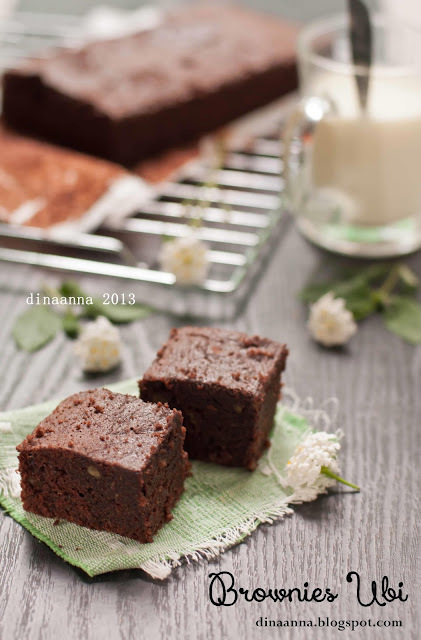 Have you tried this Bunda Ricke Indriani's black glutinous rice steamed brownies? Yes? 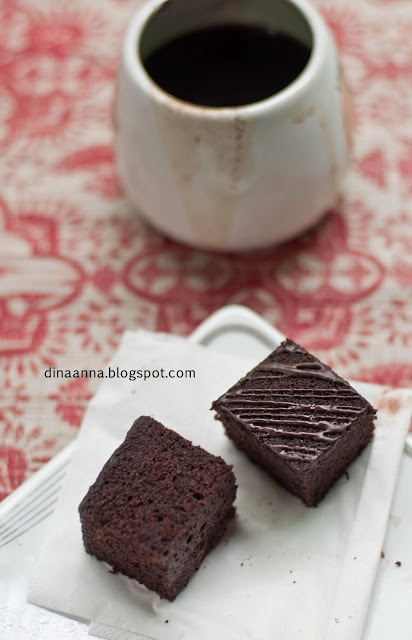 Then you must be agree with me, this brownies is soooo good, taste and texture wise. 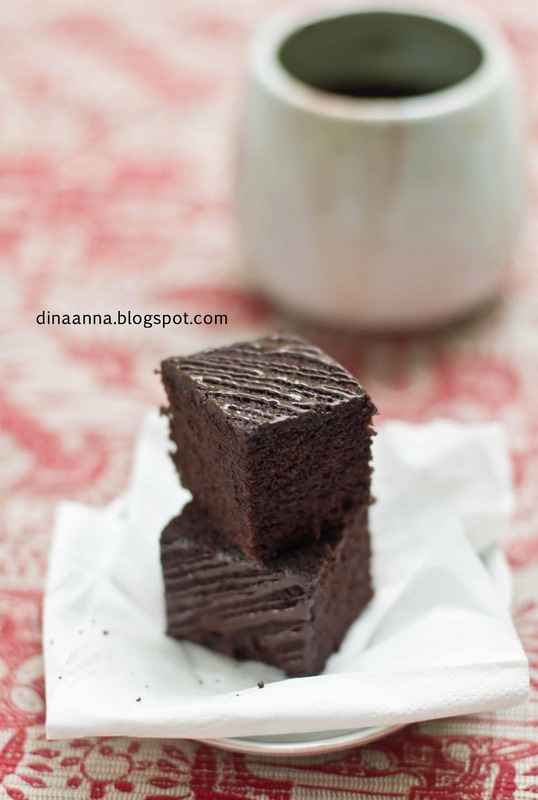 The chocolate is just right, not too strong but pair perfectly with the black glutinous rice. 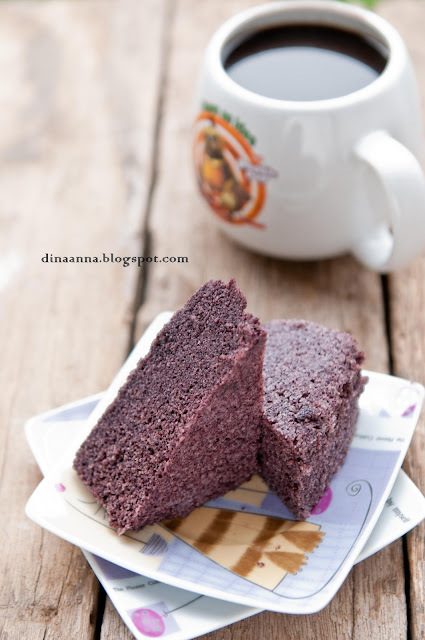 The texture is moist and to my surprise it is not as gritty as the black glutinous rice steamed cake I made before. Surely, this will be one of the favorites. Heat enough water in a big pan. Melt chocolate and oil on a stainless bowl over that simmering water. Remove from the heat and stir well. Grease a 20 square baking tin and line the bottom with wax paper. When the water already hot enough. Off the stove and remove the pan to the table. Place the eggs, sugar, salt and condensed milk on a heatproof bowl. Put the bowl in the pan with hot water. Beat on low speed until the sugar dissolve. Remove the bowl from the heat. Increase the speed to high, beat again until thick and pale. Off the mixer. Heat again the water in the pan. Place a steamer on it. Add the flour and cocoa powder in the batter while sifting in 3 batches. Fold it carefully. Remove some of the batter to a bowl. Pour in the oil and chocolate mixture. Fold it slowly and carefully until well incorporated. Pour it back to the batter. Fold it well. Pour half of the batter in the baking tin and steam it on medium heat for 10 minutes. Sprinkle the chocolate rice and pour the remaining batter and continue to steam for 30 minutes. Remove from the steamer. Let stand for about 10 minutes. Then invert the cake onto a plate. One ingredient banana "ice cream"
One afternoon I handed a cup of this 'ice cream' to Rachel, my daughter. "What's this, mom?" She asked. "Ice cream" I answered with smile. "It tastes banana, it smells banana, it has the colour of banana"
"Of course, it is banana ice cream, made only of banana" I replied. "Only banana? no other things?" She took another spoonful and sip it slowly, tried to taste it more carefully. "It is soft and creamy like ice cream"
We can find this 'ice cream' recipe in lots of food blogs. 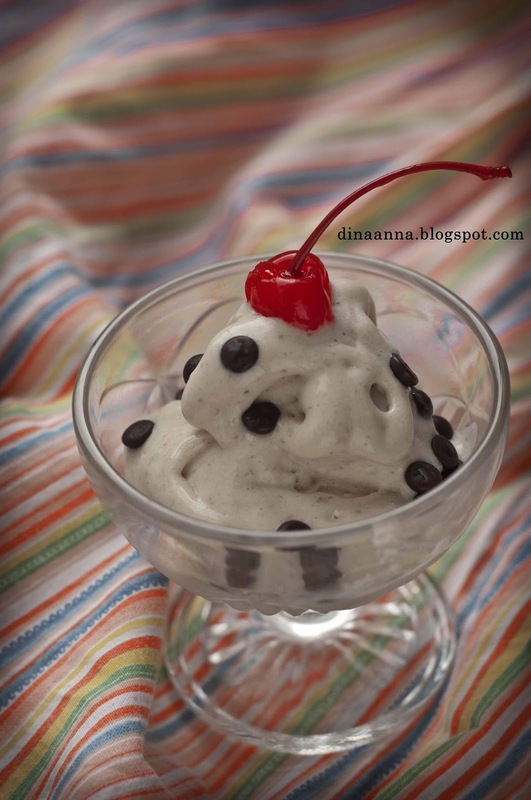 It is damn easy to make this "ice cream'. We only need to cut the ripe bananas into small pieces and freeze it. After a couple hours or so, put the frozen bananas in a food processor then blend and blend and blend again on high until they turn out creamy like ice cream. Eat immediately before it melt. My daughter might find it interesting but my boy did not. He thought that it was too banana-y, like just a mushy cold banana. 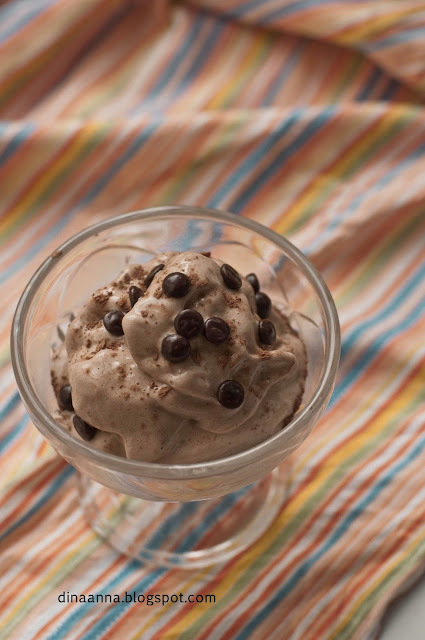 Though I added a dash of cocoa powder on the second batch and turned it into chocolate banana "ice cream". He still said no. 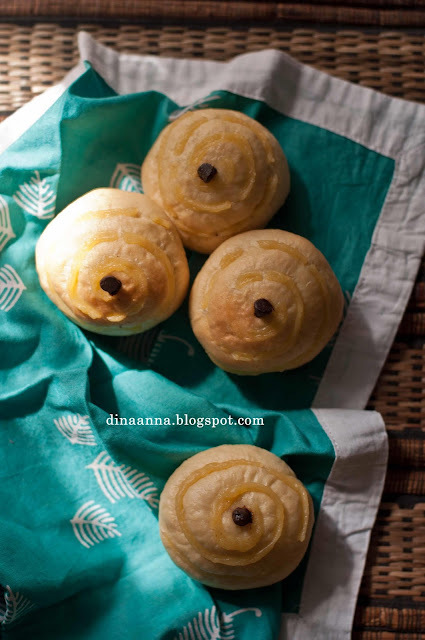 From the same recipe of putu ayu ketan hitam, I skipped the coconut layer and poured the batter into a round 18 cm baking tin instead of putu ayu molds. Simpler and faster, right? 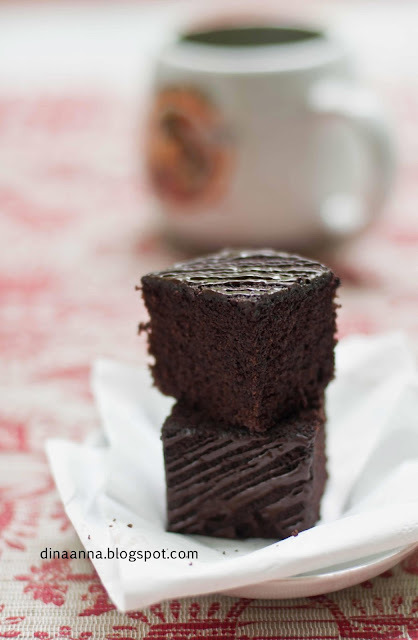 The batter was a bit thin so that the cake became dense, but still moist. It was sweet and tasty with a unique gritty texture. 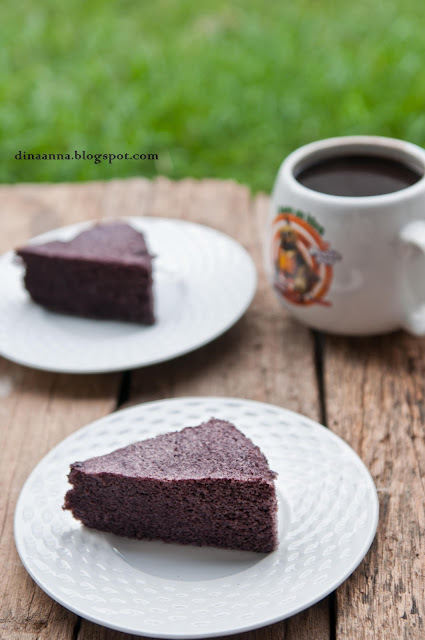 It's kind of eating bubur ketan hitam in the form of a cake. My sister loves the colour and the texture but my boy find it unappetizing. What about you? This was my third time making sweet corn bun. The first was long long time ago. I didn't remember who's recipe I used, but I remember the process. I used 200 gr corn kernels, the recipe stated to crush half of it and knead it with other ingredients to make the dough. Then combined the other half after the first fermentation. But my already elastic dough became wet again after I added the corn kernels. 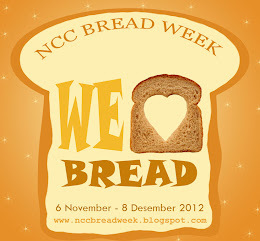 I had little experience with bread making at that time, it made me confused. I found it difficult to be handled. Despite that difficulty, my bun was surprisingly soft and rose well. The second time was about 3 weeks ago. My husband and 3 of my children went to Jogja to visit my sister in law while I had to stay at home with my youngest daughter. I made the buns for welcoming them back home. That time I just used the crushed corn and skip the corn kernel. It was really good. But because I didn't strain the corn then we could feel the hull when we bite the bread. I thought I crushed it too smooth until it resemble sweet corn puree. The puree blended well with other ingredients leaving the hull around the bread. So this time, I pushed the corn puree through a strainer. I only used the juice and discard the hull. Now, the bread was clean from the hull and just feel like any other bread. It was soft and sweet. The taste of the corn was so light, almost undetectable. You can't probably even notice that there is corn inside it. But surely you will get all the goodness of corn in every bite. Actually I had some spare corn kernels for the fillings. I wanted to sprinkle the kernels at the shaping stage (after we divide the dough into smaller portions). But my children ate them all. so I just grabbed cheddar cheese instead. 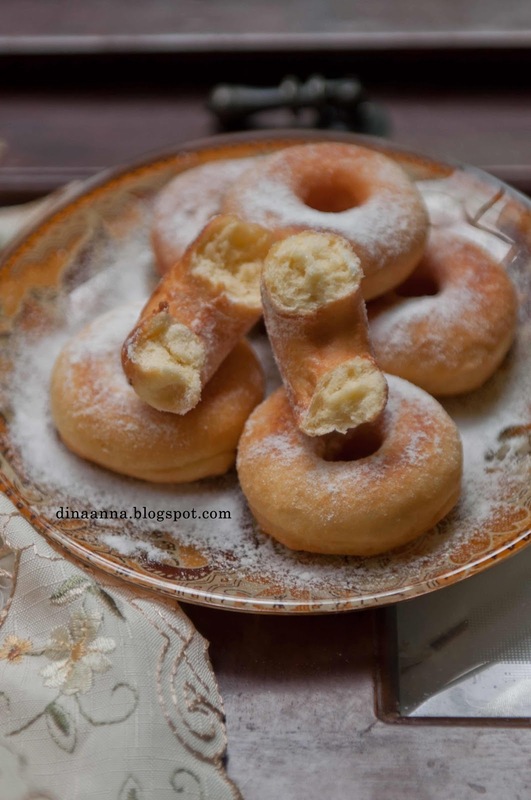 Because my children really love doughnut, I used half of the dough to make doughnut. Just like the bread, the doughnut was also really good. Then, it all depends on you. If you like the corn bites sensation, just crush the corn lightly and also sprinkle some corn kernels as the filling but if you prefers a clean one like the ordinary bread, strain the puree and skip the corn kernels addition. Blend corn with another 50 ml water. Strain and discard the hull. 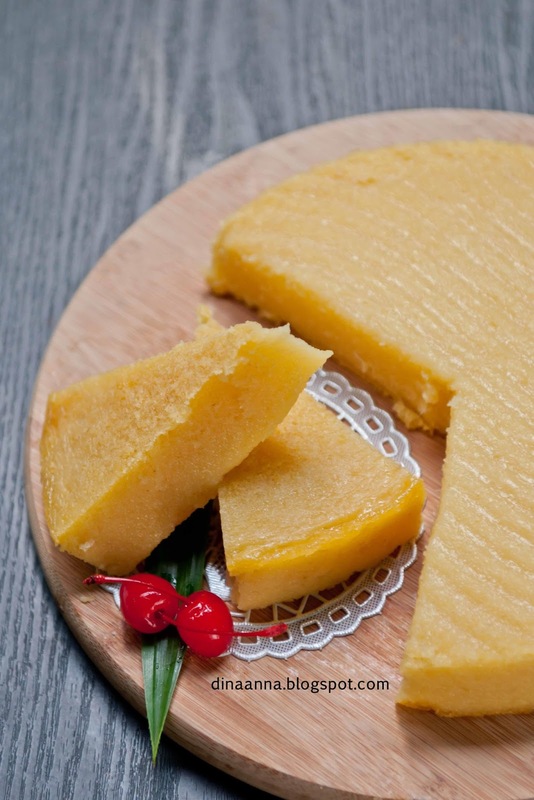 Combine corn, flour, milk powder, sugar, and yolks with a wooden spoon. When the yeast is already frothy, pour it into the mixture and knead until all are well blended. We can use the mixer with dough hook or just our hand. Add oil or margarine/butter if you like and salt and knead again until the dough is elastic. Drop extra flour and or water little by little if the dough seems to wet or dry. 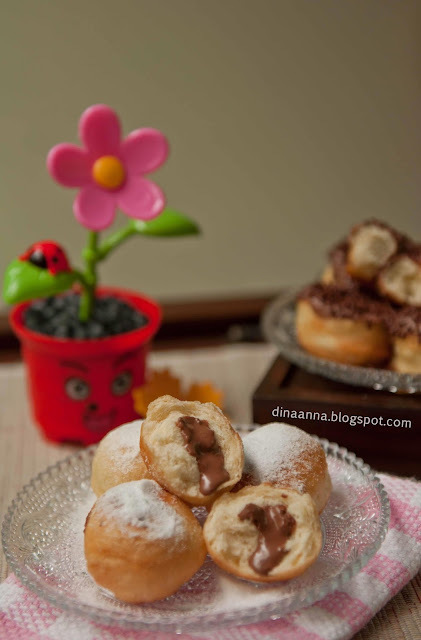 cut the dough into 35 gr each, roll it into a ball and place it in a greased 22x22 cm baking tin. It yield 16 buns. 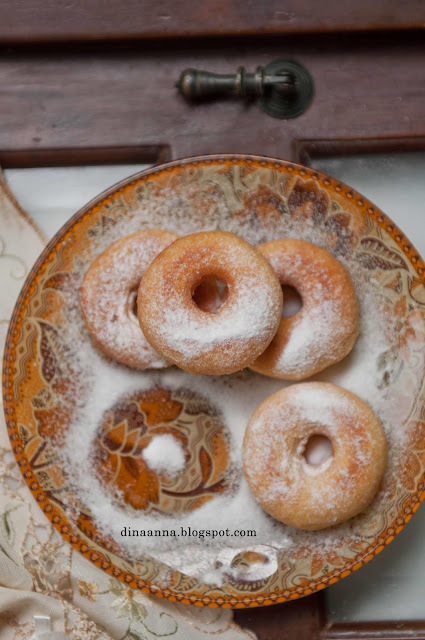 Set aside the rest of the dough for doughnut. Take the rest of the dough. Roll it out with a rolling pin. Cut using mini doughnut cutter. Place the doughnut on a greased baking tray. 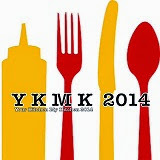 Cover . Heat oil on the frying pan. Fry doughnut on a low heat until golden brown. Back to the bread. Heat the oven. 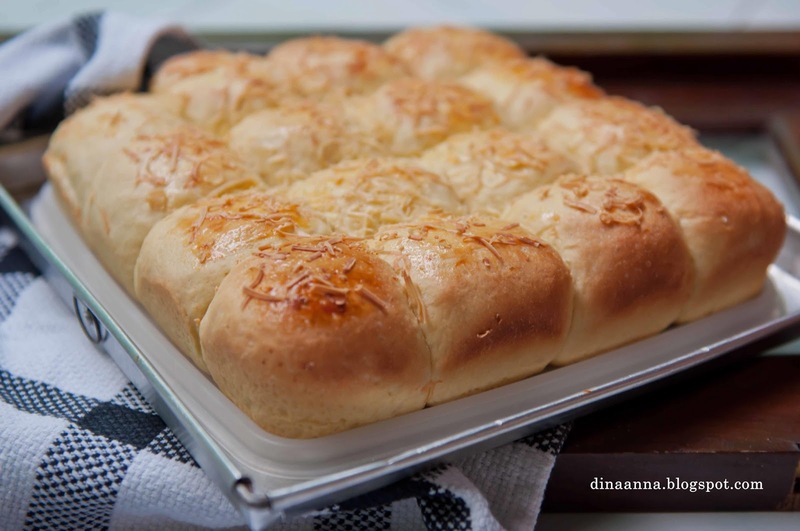 Brush the bread with egg yolk and sprinkle with grated cheddar cheese. Bake until golden brown. 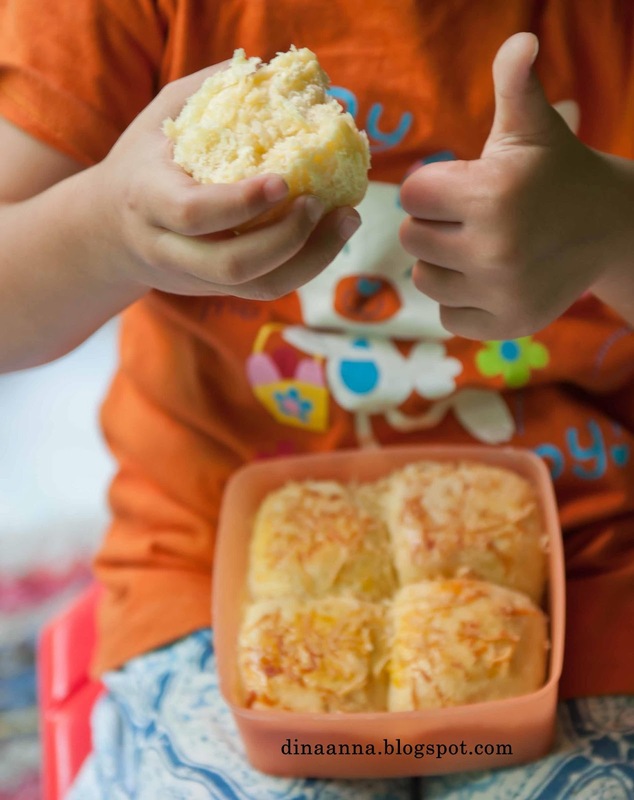 I am submitting this post to little thumbs up event this month with corn theme, organised by Zoe of bake for happy kids, Mui mui of my little favourites DIY Esther of copy cake kitchen. Wanna read other participants' post? please see this post. As I said before, this cake had purple sweet potato on the bottom layer and pumpkin on the top one. The recipe stated that both ingredients have to be blended with 50 ml milk each. That made them, especially the pumpkin, watery. Then when they were incorporated in the cake batter, the batter became thin. I already hesitate when I saw it but the show must go on, right? So, I kept continue the process and ... this was it, a not really beautiful cake, dense though still tasted good. The second problem was my baking tin was too small. Only half of the pumpkin batter could fit in. That's why, the pumpkin layer was thinner than the purple sweet potato one. Perhaps then, I think that we have to see the quality of our sweet potato and pumpkin before adding the milk. We can just try to use a fork instead of a blender. If we get a perfect smooth mash, we can reduce or even omit the milk. Blend mashed sweet potato with 50 ml milk. Pour on a big bowl. Blend mashed pumpkin with another 50 ml milk.Pour to another big bowl. Prepare the steamer. Grease and line a baking tin with baking paper and grease again. Beat eggs and sugar until thick and pale. Off the mixer. Add in the flour while sifting in 3 batches. Using a spatula, mix carefully until well blended. Divide the batter into 2, half to a bowl of sweet potato and half to the bowl of pumpkin. Fold slowly until well blended. Pour the sweet potato batter into the pan. Steam for 20 minutes. Remove the tin from steamer and pour the mashed pumpkin batter on top of it and steam again 35 minutes. 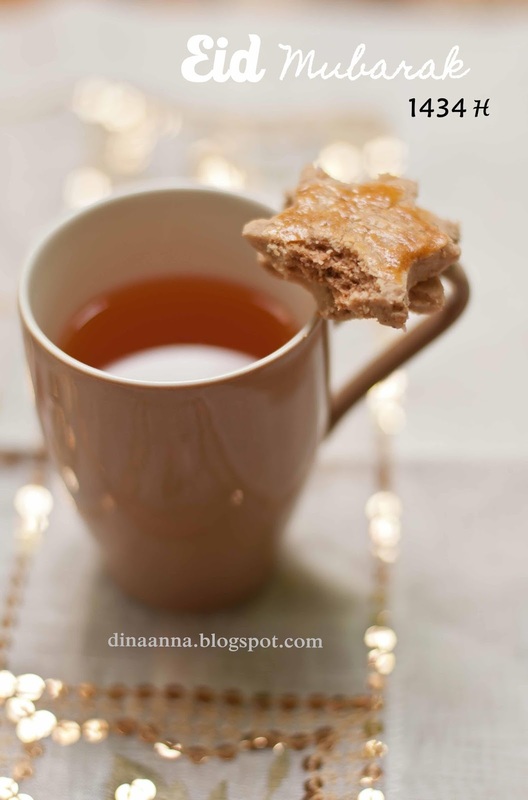 It's nice to be back again to this blog, after more than 2 months absence... Why? What happened? How are you? Where were you? Maybe you will ask me those questions... He he, I am really just fine, everything is okay and I am still here, in Semarang Indonesia, though not in my house...yup, last February I moved from my little home sweet home to a rent house. That's why I am so sorry I couldn't visit and update this blog. I was really busy cleaning, sorting, packing and rearranging all stuffs...so many things, I can't believe I have and keep all those things, big and small even tiny things in my house. It is not easy to leave the house, really. So many memories there, mostly happy of course. But the thought of having a more proper home reduced the sadness a bit. Before we started the renovation, we had a selametan with some of the builders. Again, I served nasi tumpeng and ayam ingkung. 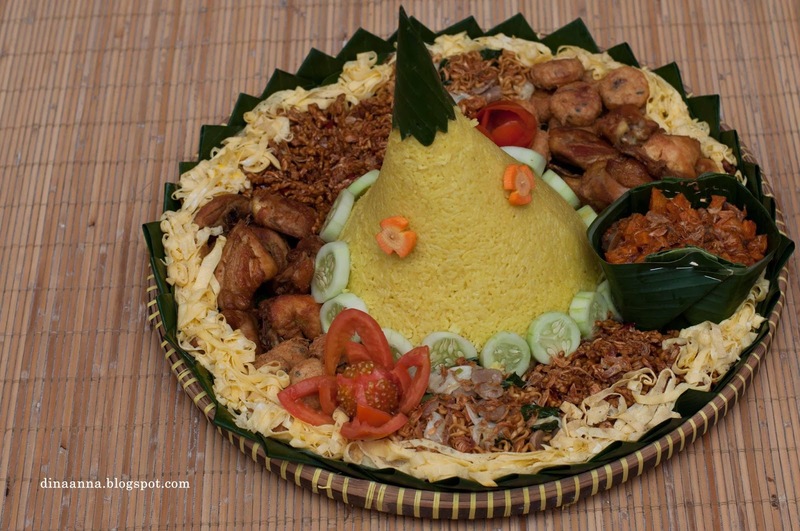 I chose nasi tumpeng kuning as my children love nasi kuning (yellow rice). That nasi tumpeng was designed for about 12 - 15 people with fried chicken, fried noodle, kering tempe, sambal goreng kentang dan ati ayam, perkedel kentang and telur rawis. They were all served in a big bamboo platter. 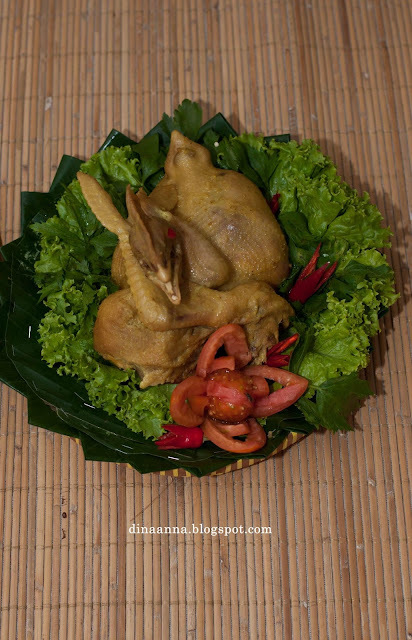 The ayam ingkung was served separately, in another smaller bamboo platter. Everybody liked them so much. They were so yummy. Unfortunately, just like my previous nasi tumpeng, they were all not made by me. I asked my friend to help me because I didn't have the time of course.